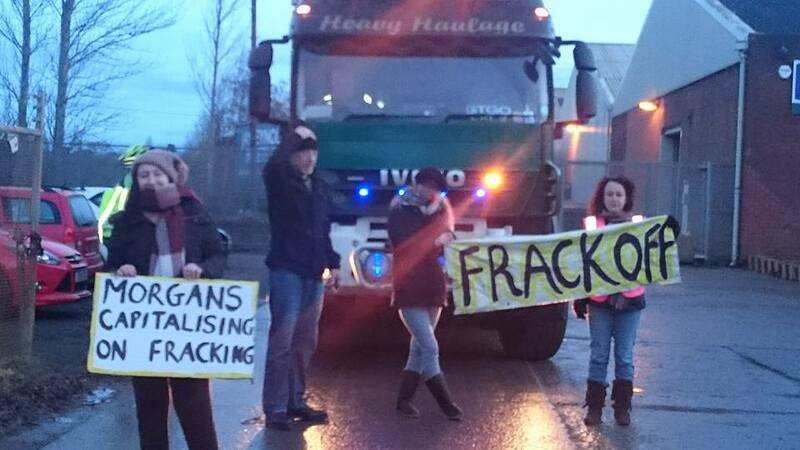 At 7am 20th February 2017, a group of residents from Chester and Ellesmere Port anti-fracking groups held a peaceful protest outside Morgans, Hooton Logistics Park. Residents were protesting about Morgans involvement in the supply of services to the Preston New Road fracking site in Lancashire. Police officers arrived at around 7.30am and after initial confusion an inspector arrived, who facilitated a peaceful protest which involved around 10 protesters “slow walking” Morgans lorries out of the depot for around two and half hours. Green and Black Cross legal observers were present. The other two businesses operating from the yard were not affected and allowed to operate unhindered.